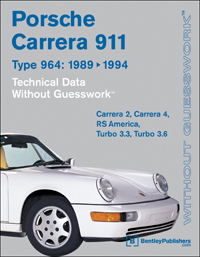 The Porsche Carrera 911 (964): 1989 - 1994 Technical Data-Without Guesswork is an invaluable technical reference source for the Carrera 964. 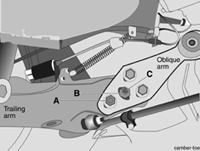 Fluid capacities, tightening torques, nominal values, wear limits, system illustrations, and electrical component locations are a few of the technical highlights you'll find in this handy sized format. This handbook offers quick access and easy navigation to hundreds of illustrations, tables and photographs, making this a must-have for service professionals and Porsche 964 owners alike. General vehicle data and application tables, engine and transmission numbers, manufacturer's maintenance schedules. 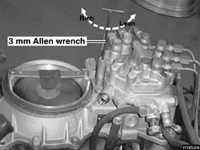 Internal engine component wear limits, torque values and assembly views of crankcase, crankshaft, cylinder heads, timing chain, and lubrication system. Turbocharger (construction and lubrication), Motronic (DME) engine management, CIS fuel injection with oxygen sensor control, charging and starting systems, and Bosch EZ69 ignition system. Rear-wheel-drive and all-wheel-drive manual transmissions, Tiptronic transmission and front final drive. 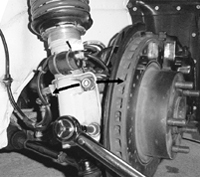 Suspension and alignment data, wheel and tire information, steering and ABS braking systems. Heating and A/C (R12 and R134a) system basics, cooling temperature graphs, refrigerant capacities, and refrigerant pressures.